I don’t know about you, but during the summer, I feel a lot less inclined to get into a hot kitchen to cook up something in the oven – besides easy things like cookies or my peanut butter banana bread, anyway. Lucky for me, my boyfriend Sean is an expert griller, and even better he enjoys doing it. No lie. My dad’s never been a big fan of the grill aside from a few times during the summer, so I didn’t know what I was really missing until we started dating and Sean introduced me to the beauty of a perfectly grilled rib eye. In fact, we grill at least once a week in warm weather. 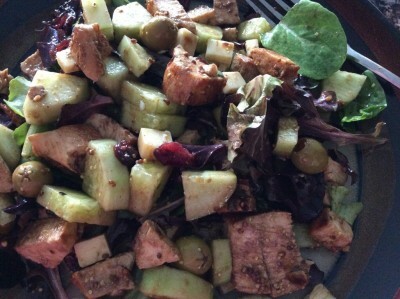 Which brings me to my post for today: the perfect summer salad to compliment your grilled meat. I swear to you, this is our go-to meal for dinner in the summertime almost every night of the week. This salad is awesome because it doesn’t require a ton of ingredients, you can really adjust it to suit your tastes or which fruits and veggies are in season, and the salad dressing only needs three ingredients and goes with everything. Are you dying to know what’s in this ultimate salad now? I think it’s pretty perfect in its simplicity. Oh, and for those of you who are paleo, gluten-free or low-carb, this suits those needs too. Without further ado, here’s your guide to the last salad recipe you’ll ever need. Dump salad greens into large bowl and set aside. Chop up chicken or steak into bite sized chunks and add to salad. Peel and slice cucumber, and chop cheese, carrots, pistachios and any other fruits or veggies you choose and add them to the salad bowl. Drop in craisins and olives to bowl. In a small mixing bowl, mix together spicy mustard, olive oil, balsamic vinegar and cracked pepper until all combined. The dressing should look dark brown at this point. If a little more sweetness is desired, add the agave or honey and mix to combine. Drizzle dressing all over salad bowl and toss the contents to cover thoroughly. Divide between two plates and voila! Dinner is served. 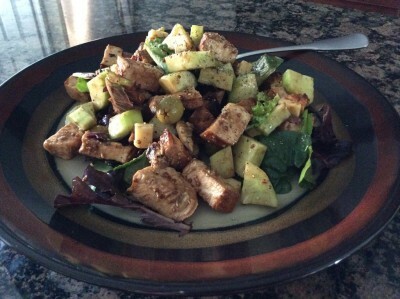 This entry was posted in Entrees, Paleo, Recipes and tagged Chicken, Entrees, Gluten Free, Low carb, Paleo, Recipes, Salad, Steak, Summer on July 14, 2014 by Paige N..